DINGO Plug-ins – Go-IoT – The one stop solution for your IoT needs! The plug-ins are 40x60mm PCBs that are plugged into the DINGO Base Board (DBB) using 28 pin connectors plus optional 7 high voltage pin connector. Plug-ins can have external contacts via the screw-connectors at the DBB. Openings for antennas can be either at the side just above the Base Board screw terminals or up through front panel of the boxing (applies only to station 3 of a 3 station DBB). Third parties are welcome to design their own plug-ins for DINGO IoT Base Boards. Image shows a 3-station Base Board with all three plug-in slots occupied. Starting from the left is a Nemeus Module consisting of SIGFOX and LoRaWAN connectivity. In the middle, there is a RS-485 opto insulated module which together with our software can communicate with anything Modbus. And to the right there is an internal PSU plug-in. This particular setup is perfectly suited to connect the old (Modbus) with the new(Sigfox and LoRaWAN). Below is an image of the vast collection of Modules that we have to date. go to our distributor partner page to get more information about ordering! 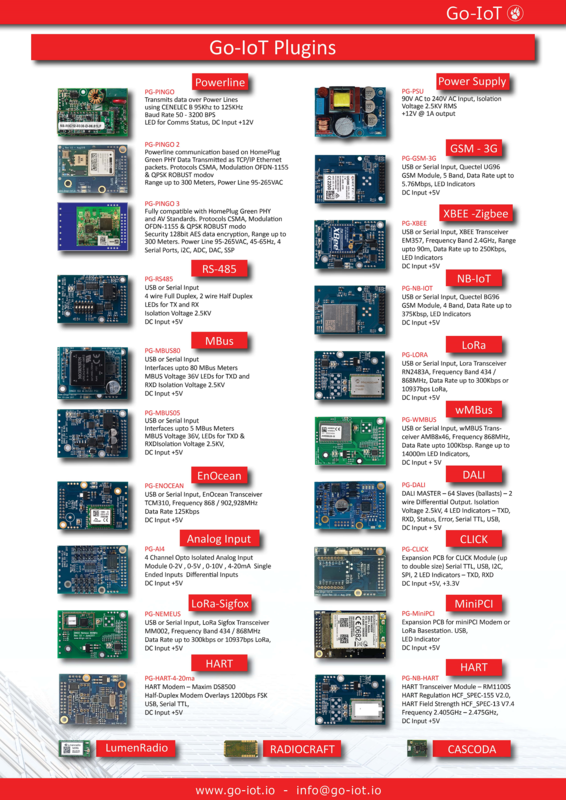 Discover the endless possibilities of our IoT modules!